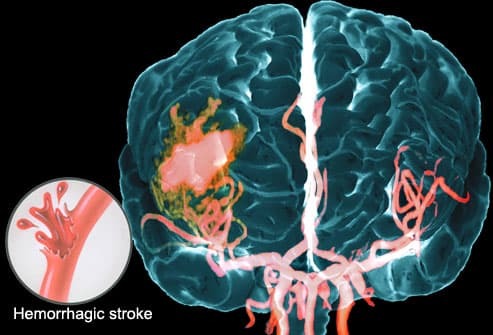 Stroke is a medical emergency and a leading cause of death in the U.S. It occurs when a blood vessel in the brain bursts or, more commonly, when a blockage develops. Without treatment, cells in the brain quickly begin to die. The result can be serious disability or death. If a loved one is having stroke symptoms, seek emergency medical attention without delay. Sudden numbness or weakness of the body, especially on one side. Sudden vision changes in one or both eyes, or difficulty swallowing. Sudden, severe headache with unknown cause. Sudden problems with dizziness, walking, or balance. Sudden confusion, difficulty speaking or understanding others. Call 911 immediately if you notice any of these symptoms. Face. Ask for a smile. Does one side droop? Arms. When raised, does one side drift down? Speech. Can the person repeat a simple sentence? Does he or she have trouble or slur words? Time. Time is critical. Call 911 immediately if any symptoms are present. Every second counts when seeking treatment for a stroke. When deprived of oxygen, brain cells begin dying within minutes. 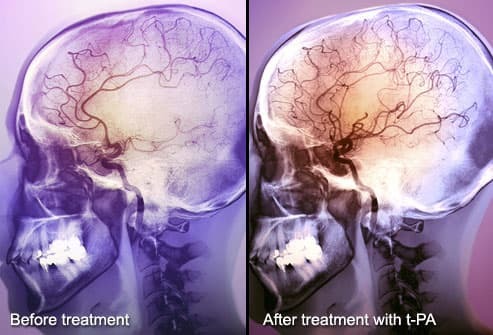 There are clot-busting drugs that can curb brain damage, but they need to be used within three hours -- up to 4.5 hours in some people -- of the initial stroke symptoms. Once brain tissue has died, the body parts controlled by that area won't work properly. This is why stroke is a top cause of long-term disability. When someone with stroke symptoms arrives in the ER, the first step is to determine which type of stroke is occurring. There are two main types and they are not treated the same way. 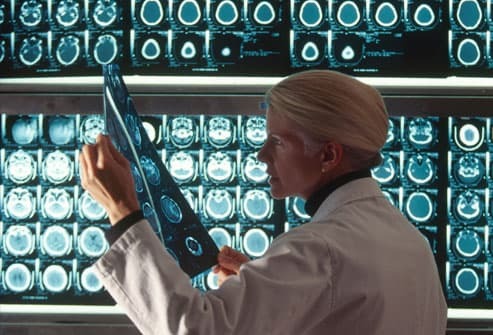 A CT scan can help doctors determine whether the symptoms are coming from a blocked blood vessel or a bleeding vessel. Additional tests may also be used to find the location of a blood clot or bleeding within the brain. Hemorrhagic strokes are less common but far more likely to be fatal. They occur when a weakened blood vessel in the brain bursts. The result is bleeding inside the brain that can be difficult to stop. A transient ischemic attack, often called a "mini-stroke," is more like a close call. Blood flow is temporarily impaired to part of the brain, causing symptoms similar to an actual stroke. When the blood flows again, the symptoms disappear. 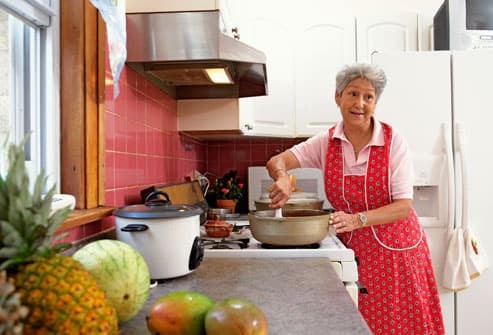 A TIA is a warning sign that a stroke may happen soon. It's critical to seek emergency medical help if you think you've had a TIA. There are therapies to reduce the risk of stroke. 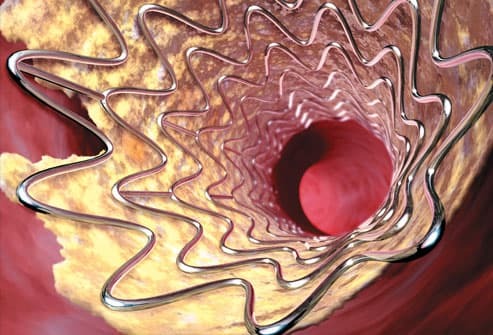 A common cause of stroke is atherosclerosis -- hardening of the arteries. Plaque made of fat, cholesterol, calcium, and other substances builds up in the arteries, leaving less space for blood to flow. A blood clot may lodge in this narrow space and cause an ischemic stroke. 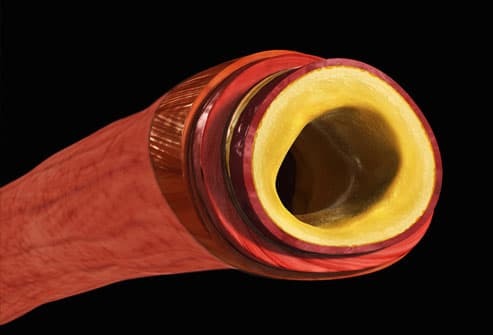 Atherosclerosis also makes it easier for a clot to form. 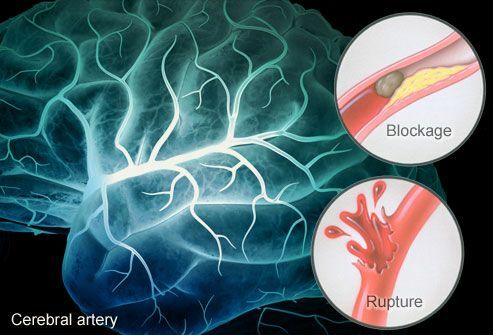 Hemorrhagic strokes often result from uncontrolled high blood pressure that causes a weakened artery to burst. Taking steps to control these conditions may reduce your risk. 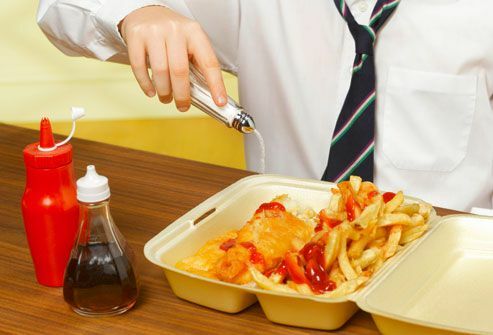 A poor diet may increase the risk for stroke in a few significant ways. 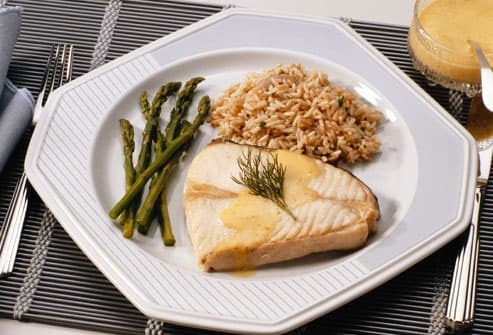 A diet high in fruits, vegetables, whole grains, and fish may help lower stroke risk. Some stroke risk factors are beyond your control, such as getting older or having a family history of strokes. Gender plays a role, too, with men being more likely to have a stroke. However, more stroke deaths occur in women. Finally, race is an important risk factor. African-Americans, Native Americans, and Alaskan Natives are at greater risk compared to people of other ethnicities. For an ischemic stroke, emergency treatment focuses on medicine to restore blood flow. 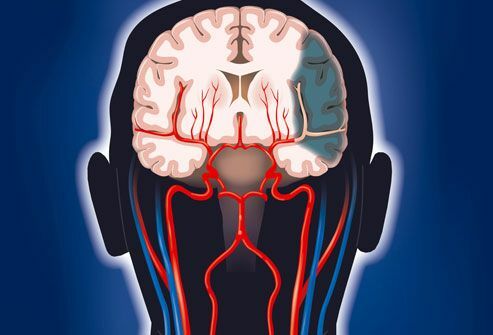 A clot-busting drug is highly effective at dissolving clots and minimizing long-term damage, but it must be as soon as possible, within three -- or much as 4.5 hours for some people -- of the initial stroke symptoms Hemorrhagic strokes are more difficult to manage. Treatment usually involves attempting to control high blood pressure, bleeding, and brain swelling. 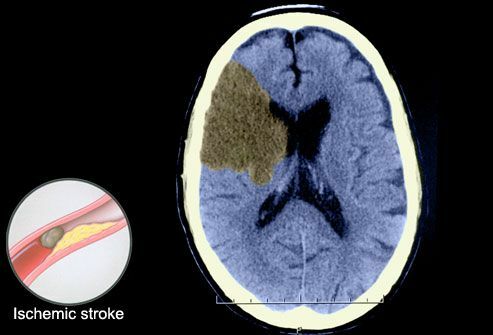 Whether a stroke causes long-term damage depends on its severity and how quickly treatment stabilizes the brain. 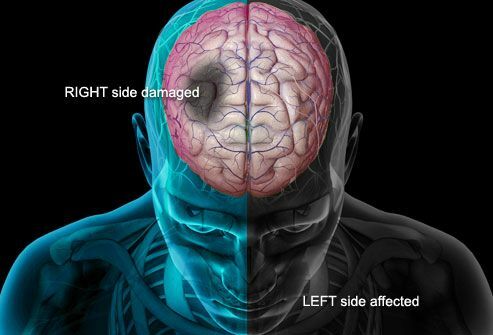 The type of damage depends on where in the brain the stroke occurs. 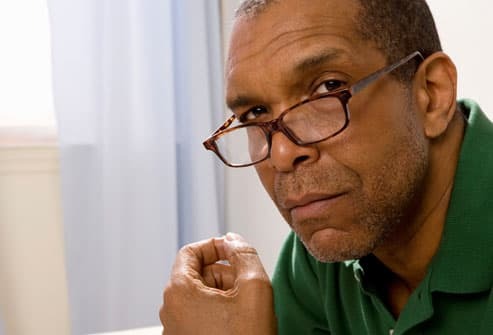 Common problems after a stroke include numbness and/or weakness in the arms or legs, difficulty walking, vision problems, trouble swallowing, and problems with speech and comprehension. These problems can be permanent, but many people regain most of their abilities. Rehabilitation is the centerpiece of the stroke recovery process. It helps patients regain lost skills and learn to compensate for damage that can't be undone. The goal is to help restore as much independence as possible. For people who have trouble speaking, speech and language therapy is essential. A speech therapist can also help patients who have trouble swallowing. Muscle weakness, as well as balance problems, are very common after a stroke. This can interfere with walking and other daily activities. 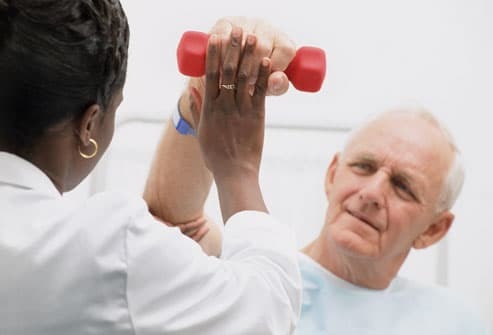 Physical therapy is an effective way to regain strength, balance, and coordination. For fine motor skills, such as using a knife and fork, writing, and buttoning a shirt, occupational therapy can help. It's common for stroke survivors and their loved ones to experience a wide range of intense emotions, such as fear, anger, worry, and grief. A psychologist or mental health counselor can provide strategies for coping with these emotions. 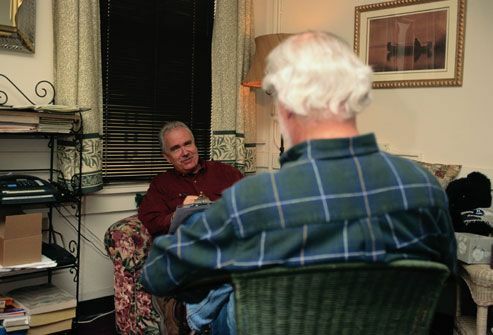 A therapist can also watch for signs of depression, which frequently strikes people who are recovering from a stroke. Limit alcohol and salt intake. Eat a healthier diet with more veggies, fish, and whole grains. 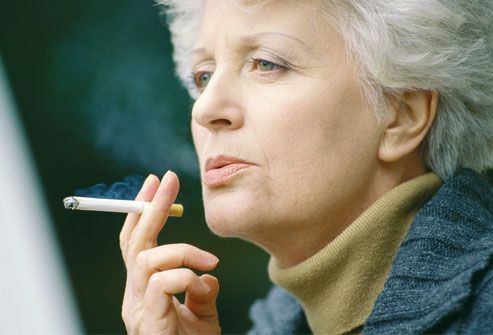 For people with a high risk of stroke, doctors often recommend medications to lower this risk. 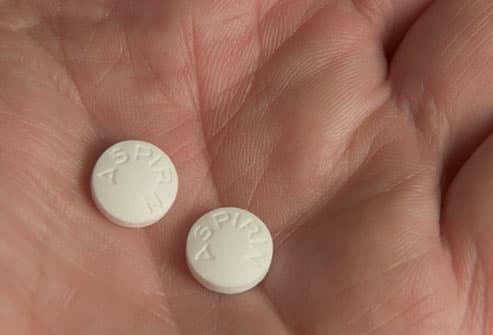 Anti-platelet drugs, including aspirin, keep platelets in the blood from sticking together and forming clots. Anti-clotting drugs, such as warfarin, may be needed to help ward off stroke in some patients. 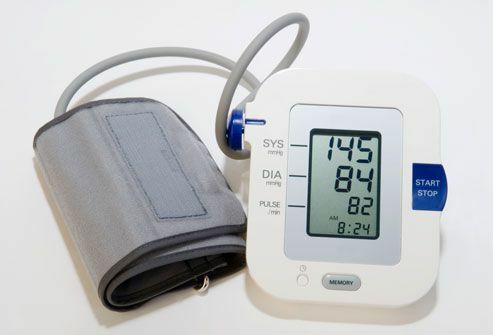 Finally, if you have high blood pressure, your doctor will prescribe medication to lower it. 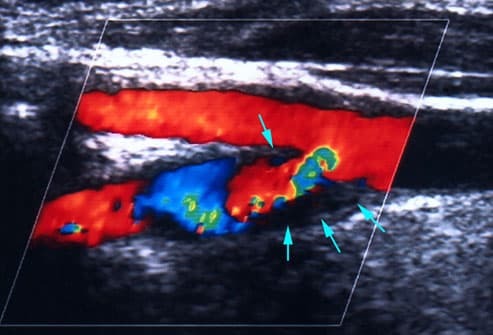 In some cases, a stroke results from a narrowed carotid artery -- the blood vessels that travel up each side of the neck to bring blood to the brain. People who have had a mild stroke or TIA due to this problem may benefit from surgery known as carotid endarterectomy. This procedure removes plaque from the lining of the carotid arteries and can help prevent additional strokes. Doctors can also treat a clogged carotid artery without major surgery in some cases. 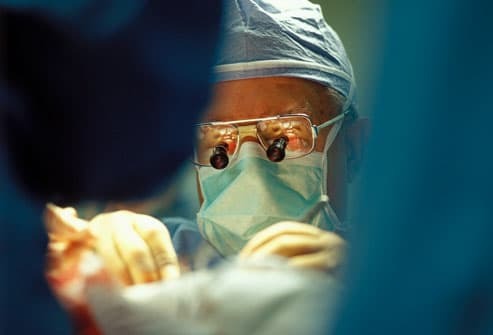 The procedure, called angioplasty, involves temporarily inserting a catheter into the artery and inflating a tiny balloon to widen the area that is narrowed by plaque. A metal tube, called a stent, can be inserted and left in place to keep the artery open. 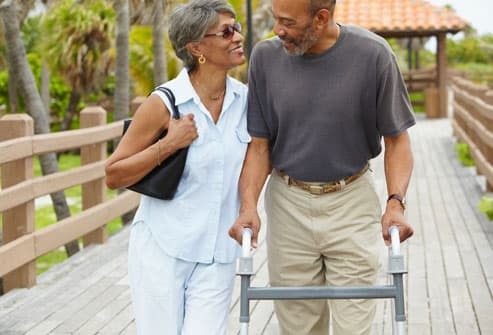 Many people who have a stroke regain the ability to take care of themselves if they follow their rehabilitation plan. Those who get clot-busting drugs soon enough may recover completely. And those who experience disability can often learn to function independently through therapy. It has been shown that 3% to 4% of all patients that experience a stroke will subsequently experience a second stroke. 5) Will & Deni McIntyre / Photo Researchers, Inc.